Cleaning your windows takes you a great deal time and efforts? You can make a change now – simply get in touch with our operators and book our window cleaning in Stroud Green. We will manage this matter for you and the results will be perfect for every part of your windows – the glass, frames and sills. With our support, you will have the opportunity to do whatever you like with the time you usually spend for window washing. However, our services will give you even more, as you can notice from our list of benefits. We also provide our professional services in nearby areas: Manor House, Finsbury Park, Harringay, Stoke Newington, Highbury. Improve the look of your office – the professionals of commercial window cleaning will take care of that. As part of our exceptional method, we use water-fed extension poles. 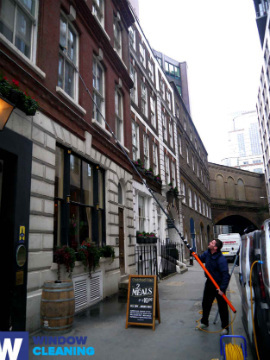 With this method, we can clean thoroughly the windows of your business premise, as high as the fourth floor. To reach highly-rised windows we use rope access. We guarantee your glass panes will look perfect, no matter how highly placed they are. With the help of the team of experts London's skyline will never be filthy. You can always rely on our workmanship and devotion for residential and business window cleaning. Our competence allows us to clean all kinds of windows you could possibly have as part of your property. For instance, you can apply for cleaning of small or double windows, French doors, sash windows, bay windows and patio doors. In addition, we include conservatories and skylights as part of our routine. So to speak, you can enjoy the good look of your windows with our timely and dependable services. The specialists of window cleaning use advanced strategies for the procedure of washing and rinsing your glass surfaces, skylights and conservatories. Our water-fed extension pole feature allows us to reach as high as the fourth floor. The pole is connected to a water reservoir in the van, neutralising the probability of damage to the exterior of your building. We also use jet washing as part of our window cleaning service. You can also take advantage of these worthwhile procedures. Request our window cleaning in Stroud Green for your home. We will use mentioner earlier techniques – water fed extension pole system for easy-to-reach windows and rope access tools for the high-rise ones. For the entire process we use purified water. Request a service today – call 020 3746 3113 and speak with our representatives. Or just fill in our on-site booking form or use our chat facility. The nearest tube station serving N4 Stroud Green is Finsbury Park.